I really like taking pictures at night. Not only is it a challenge to manage the light and get an interesting composition, I seldom know what I get until I open the image on my computer. I can't see the image on my camera, because I have the brightness of the display turned way down so it doesn't interfere with the composing of the shot. Here is the central plaza fountain in Antigua, Guatemala. I try to avoid taking photographs of tourists, but here I think they add to the scenery. 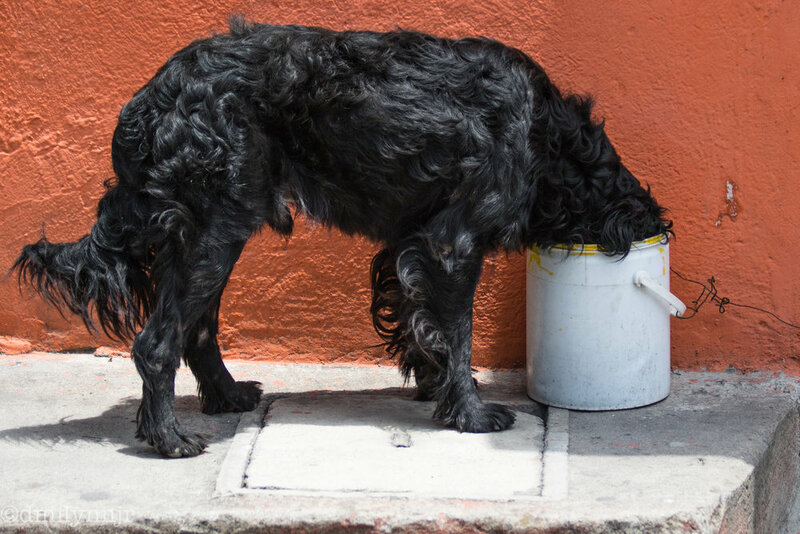 In Xela (Quetzaltenango), Guatemala street dogs abound. This one caught my attention with his beautiful shiny black coat. He's a wanderer and here he might have found a tidbit. 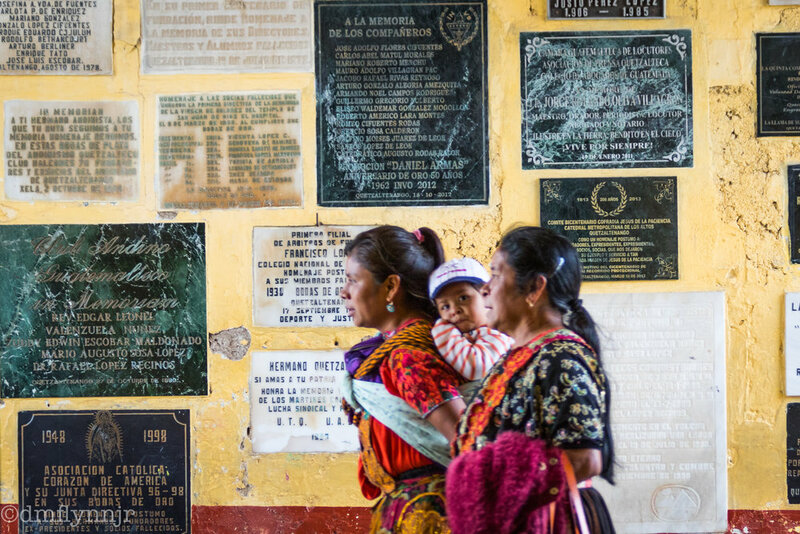 In the cemetery of Xela, Guatemala, three generations of women pass through the entrance arch on their way out of the cementerio. I spent a good few hours one Sunday afternoon in this colorful place where people were not so camera shy as they were in the city. I am attracted to cemeteries and always seem to find myself in one when I travel. They are peaceful places and reflect a part of the town's culture and history. I like this shot because only the little girl notices me, while mother and grandmother look straight ahead. A woman carries recently cut grass from the cemetery in Xela (Quetzaltenango), Guatemala. Xela is the second largest city in Guatemala and takes great pride in its cemetery, one of the most colorful I've seen. While I was in the small town of Copan Ruinas the city had a power failure after a rain shower. The streets turned into black mirrors, reflecting what little light there was from automobiles. I love the stone texture and the wires above the streets. Copan Ruinas, where a civilization thrived over 1200 years ago, is one of my favorite places in Central America and worth another look. This is one of my favorite moments in León. 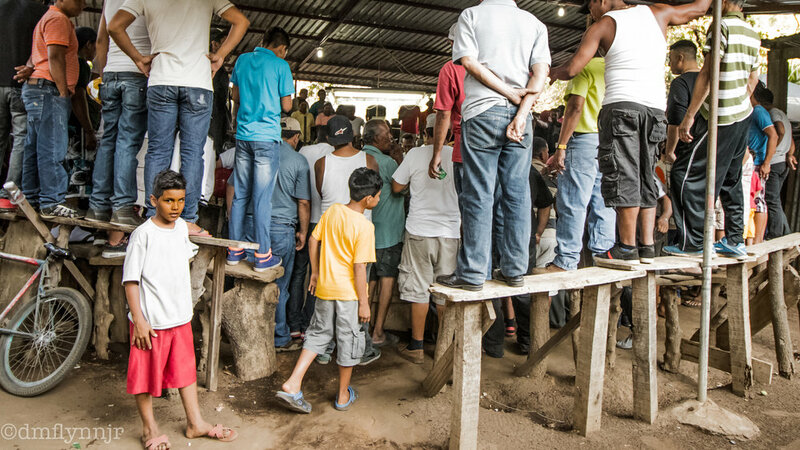 It's late afternoon on a Saturday and the cockfight, or gallera, is packed with men wagering on the outcome of a pitched battle between two fierce roosters. The birds are highly skilled and know how to swipe the razors tied to their feet to inflict damage, drawing blood and gore from their opponent. More interesting to me was this scene where two boys walk around the perimeter. One is anxious to see the action. The other, who has but one eye, looks warily in my direction. As a photographer I was not only caught in the moment but also drawn in by the honesty of primary colors.